The Introverts sat in a row, poised for the question. On the other side of the table, the Extraverts were ready. This exchange is classic between the two personality types. Extraverts wanting to fill in the conversation lapse and Introverts at ease with the lull. During the quiet, plenty happening for Introverts. When I watch the Introverts closely, I can see they are deep in thought. Over the years in facilitating Myers-Briggs Type Indicator (MBTI) workshops, the highlight for me is how the opposite preferences engage with one another. It has helped me to understand people in my life and how my impressions have been inaccurate and sometimes totally mistaken. In my previous blog posting, I highlighted 9 things you may not know about Extraverts and the definition of both. The question behind the preferences of Extraversion and Introversion is: Where do you get your energy from? Extraverts get their energy from being outer directed while Introverts are inner directed. 1. Thinking before talking is a hallmark of an Introvert. Their preference is to go inward first. This can be unsettling for Extraverts who are dealing with the outer realm as their first go-to. Extraverts may want an answer quicker than an Introvert is providing. Introverts can be perceived as not caring or not wanting to talk about an issue. When you get to know Introverts, those perceptions are far from the truth. 2. Introverts offer a good deal to conversations. I was once in a relationship with an Introvert. We were having “the” conversation. When I asked him where he thought the relationship was going, he said he didn’t know. Then I asked him where he wanted the relationship to go, and he said he didn’t know. Later I remembered he identified himself as an Introvert. I had a listing of 30 great questions for couples to help understand each other. I emailed them to him. He began writing a response to the questions and ended up writing 13 pages in response. When we got back to the conversation, he had a lot to say on the matter. 3. Introverts talk just as much as Extraverts. They just like to think first. Often Introverts have a lot to say on a matter because of their preference of going deeper into a topic. I have heard Introverts say they appreciate Extraverts to keep a conversation going. 4. Introverts make great stand-up comedians. Or anything else where they are doing an activity on their own. 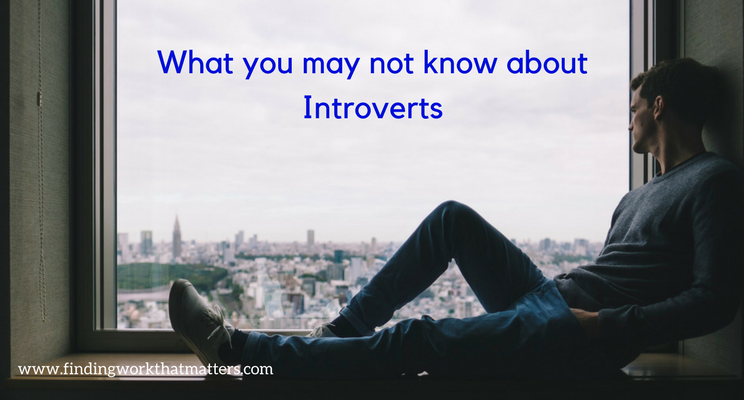 This may surprise people as they see Introverts as quiet or wanting to be alone. Introverts have told me that they enjoy doing presentations, where they are in front of a group sharing information. They would prefer not to have interactive components. One of the key things to remember about Introversion is that it is about how a person gets their energy. Introverts get their energy from being inner directed. 5. Introverts are not shy. Shyness is a quality that both Extraverts and Introverts have. Shyness is a response to our environment. 6. Introverts are quite fine with doing Extraverted activity. To a certain degree. Depending on their energy level combined with the Extraverted activity, Introverts can feel energized. They may prefer to put a cap on the amount of socializing time or be with a smaller group. 7. Introverts prefer one-on-one interactions or emailing or texting. This allows them time to consider what the person is saying and how they want to reply. Writing can also be a preferred choice for Introverts. Because Introverts go inside first, when they speak they have many of their ideas worked out already, allowing them to articulate in deliberate ways. It works well with their ability to think deeply on an issue. Introverted leaders include: Barack Obama, Albert Einstein, Rosa Parks, Eleanor Roosevelt, Mahatma Gandhi. Rather than get involved in chit chat, Introverts prefer to focus on a topic. That ability helps them in preparing for presentations or conversations. They prefer to be purposeful when engaging with others. Any other thoughts on being Introverted? 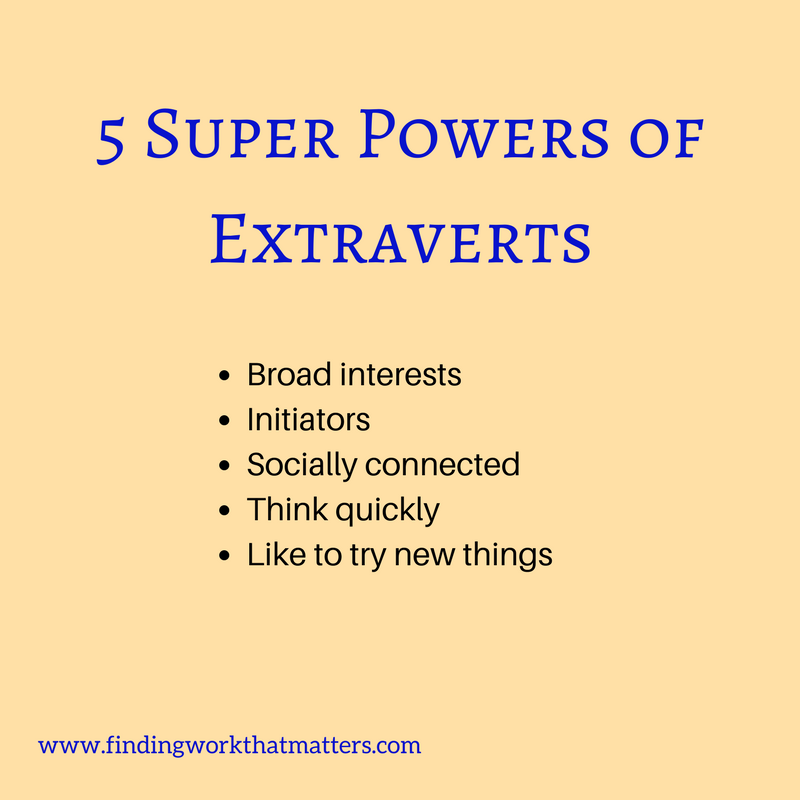 What do Extraverts need to know about you? The world is comprised of 50% Introverts and 50% Extraverts. Thankfully. Because each type can find the other exhausting. Extraversion and Introversion are the key “attitudes” for personality type. What we know as Myers-Briggs Type Indicator or MBTI. The MBTI assessment is used all over the world as a tool to help people understand themselves better. For over 20 years, I have used personality type to help people find the work that will fit best. Where they will shine in the work world. And I have lived my life as an Extravert. There are lots of misconceptions about Extraverts and Introverts. In this article, we will look at life from an Extravert’s perspective. In the next posting, we will look at Introverts. In 1921, Carl Jung, Swiss psychologist wrote Psychological Types and introduced us to the idea of dominant functions. The premise is this: when you are using your dominant function, you are working in your strengths. Your personality type is at the core of who you are and though individuation (moving towards wholeness by using all aspects of yourself) is the goal of humans, your dominant function is part of that fundamental part that doesn’t change in your lifetime. What happens is that as you age, you become more and more of who you really are. As you get to know yourself, your functions as defined by Carl Jung, become clearer. The question around Extraversion and Introversion is: What energizes you? When you are drained or exhausted, what do you do to recharge? Extraverts get their energy from being outer directed. They prefer to interact with the outer world; this includes being with others or doing outward activities. Introverts get their energy from being inner directed. They prefer turn their attention inward; this may include doing things alone or one-to-one. You perhaps are thinking that you have both tendencies. Or you may notice that you have one more dominant than the other. We all have the ability to do both. But we prefer one over another. It’s a function of how our brain works. Over the my years of delivering MBTI, I have seen some awe-inspiring interactions between Extraverts and Introverts. One of the activities I facilitate is dividing the groups into their types and then ask them to interview each other. What would they like to know to help them understand the other type? 1. Sometimes what comes out of an Extravert’s mouth is the first time they heard it. Because Extraverts prefer to work out their ideas by talking them through, they are energized by playing around with ideas. Introverts find this surprising because they will always have thought through an issue first. 2. Extraverts put their foot in their mouth. Because Extraverts prefer to talk before they think, they can say things that may unintentionally offend others. 3. They can be shy. Shyness is a response to an environmental situation. It is not a characteristic associated with either Introverts or Extraverts. Extraverts are also not necessarily confident. Extraverts like the outer world of doing things, accomplishing and interacting with others. They like starting conversations or suggesting activities. 5. They are expected to keep the conversation going. Though Extraverts love to talk things through and start conversations, they find that they are often depended on to keep the party going. Extraverts appreciate being introduced to new ideas. And they can usually run with a new topic. 6. They have a broad range of interests. Extraverts preference is to skim the surface; they enjoy talking with a variety of people and are energized by many topics. 7. Solitary activities are draining. Going on retreats or spending a weekend alone can make a Extravert wilt. They might have a response like, “too much of a good thing.” Extraverts do not need to be with another person all the time but they prefer not to have extended periods of time alone. 8. They like meeting strangers. Going on solo trips is a great activity for the Extravert who is okay with travelling alone. This way they will meet new people and be introduced to new activities. An Extrovert will shine in work where they exposed to new people. 9. Extraverts can find Introverts exhausting. And vice versa. Extraverts like a fast-paced conversation. Around an Introvert who like to think first, Extraverts can perceive Introverts as having nothing to say on the matter if they don’t answer right away. In the gap, an Extravert will want to fill in the space. So before an Introvert has answered a question, an Extravert is on to the next question. As you can see, this would be exhausting for both parties. Any other thoughts on being Extraverted? What do Introverts need to know about you?